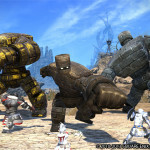 Square Enix has revealed new details about their upcoming MMORPG crossover featuring Final Fantasy XI, Dragon Quest X, & Final Fantasy XIV. 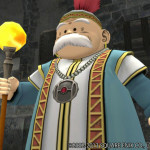 In the game, there will be a sage from Dragon Quest X and he will journey to the lands of Final Fantasy XI looking for a slime. As part of this story, a new event type will be added called a Monstrosity Event. 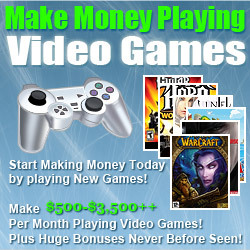 This allows players to control monsters and thus you’ll be able to play as a Blue Slime. Slime gear will be added to the game as well. Also, Spriggan, a monster from the world of Final Fantasy XIV: A Realm Reborn will suddenly show up in Vana’diel. It seems the Moogles can talk to Spriggans. 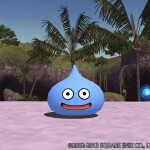 Just like the Blue Slime, players will be able to control the Final Fantasy XIV monster using a Monstrosity. Players can get Spriggan equipment too. Shantotto from Final Fantasy XI makes her way to Final Fantasy XIV and shows up in the land of Eorzea. You will be able to to fight her in a FATE (which stands for Full Active Time Event). If you’re able to win, she can join you as a minion. Minions are in FFXIV what mini pets were in WoW. There’s also another FATE where you’ll fight Golems from Dragon Quest X and victory will net you a Golem minion. Shantotto also makes an appearance in Dragon Quest X and she’ll give you a Chocobo hat if you help her find certain materials she is looking for. In other crossovers, there will be a moogle from Final Fantasy XIV: A Realm Reborn that will be giving out a quest in Dragon Quest X. The reward for this quest is a Cactaur Mask. This is all scheduled to start on December 11th and will begin with FFXIV and DQX crossing over into FFXI. There will be other FFXI events taking place sometime in 2014. DQX is supposed to get FFXI content sometime between mid January and mid February. The moogle quest line will be added afterwards in sometime in mid February to mid March. 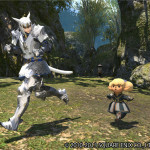 Two other crossovers for FFXIV will be added around the end of January to early February 2014.